The final studio disc from Flash, this is probably the least consistent of their albums. It’s also the most ambitious. Nothing here is what you’d call bad, it’s just that it seems to lack direction a lot of time and doesn’t have the power of their first two discs. It is a concept album about war and chess – does that bring to mind Yes’ “I’ve Seen All Good People” a bit? Here we get a short, ambient instrumental motif that serves as the introduction to the album. They fire out into a killer funky rock jam that’s got a lot in common with Pink Floyd. A Yesish burst of sound takes it to the verse and I can hear a lot of Starcastle in that section. These elements are alternated to create the main song elements here. The instrumental segment that comes after the first vocal movement is very much in the vein of old Yes. After another set of vocals Peter Banks’ guitar takes over and drives us into a different Yesish motif that takes the cut to its close. The main structure of this is a ballad that has a lot in common with more modern progressive rock. It ends with a weird little ambient bit. With a playful folky element, the intro to this feels a lot like Yes. They bring it out to a more rocking, but still quite melodic, musical journey as they carry forward. Little instrumental segments serve as punctuation here and there. Later we get a cool Yes-like wall of vocals section with some seriously country-like guitar. Banks takes us on a guitar journey later and then deposits us back into the song proper. They take us out later into another melodic instrumental journey. There’s quite a bit of jazz in that mix. A rather odd little instrumental journey opens this. Although it’s a bit unusual it’s also quite cool. This intro ends just before the one minute mark and the cut feels like it might explode out into something from Pink Floyd’s The Wall. Instead the band move into a fast paced Yes-like movement and then shift it out again into a new prog jam for the vocals. It evolves out through a series of changes, alterations and variants into a killer and quite dynamic and potent prog rock journey. Although there are still more pure prog rock elements here, this is based in a rather funky harder rocking sound at first. It shifts out into mellower and more melodic prog and we get some backwards tracked bits early in this new progressive excursion. There are some unusual twists and turns here and there in the course of this. There are a lot of odd contrasts on this. Parts of it almost feel like disco and yet we also get some of most powerful and dynamic sounds of the whole album. Fast paced this is psychedelic meets prog rock. It’s a real powerhouse with some interesting changes and alterations. Around the one-minute mark we get a weird little King Crimson-like section and then they take it out into more melodic territory before veering into another guitar based movement. A wall of unaccompanied vocals deliver the lyrics and they continue by alternating this with musical elements until shifting it to material that’s more in keeping with the standard Flash sound. They take us through a number of variants as they carry along. 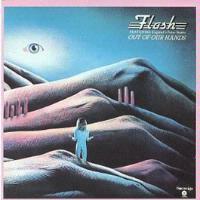 This has more of a plain rock and roll element to it, but merged with the brand of prog that Flash is known for doing. There is even an almost metallic slower jam in this that turns more space rock oriented. The vocal arrangement is really what makes the majority of this, but we also get some cool jazzy stylings later. That section is grown into a killer extensive outro. They end things with a fairly short hard rocking jam. They drop it way down for the vocals and then grow upwards into something closer to what we’re used to from this outfit. It continues with its organic evolution until it finally moves out into a short instrumental segment to end.